Messe zeitgenössischer Kunst in Chile, 1. - 5. Oktober, Centro Cultural Estacion Mapocho, Santiago. Die UiU Fototour zeigt Highlights und die Atmosphäre der Messe. Einige Highlights und die Atmosphäre der Messe. Ch.ACO, die Messe zeitgenössischer Kunst in Chile, fand vom 1. bis 5. Oktober im Centro Cultural Estacion Mapocho in Santiago statt. Vertreten waren 30 Galerien aus Lateinamerika, Europa und den USA; 12 Pop_Up Spaces - unabhängige künstlerische Projekte aus Chile; eine neue Sektion für chilenische Meister moderner Kunst; 18 Stände von Verlagen für Kunst, Architektur, Lifestyle und Design; drei Sammlungen von Unternehmen (Vodka Finlandia, Nacional Librería, TrasparentArte). Es gab ein umfangreiches Programm von Vorträgen und Gesprächen; Kunstprogramme, und es kamen über 1.000 nationale und internationale VIP-Gäste. This year, during the Fair's days devoted to art professionals, the foundation in charge of the Fair, FAVA (Fundación Artes Visuales Asociados), launched its Patrons Program. This initiative was born from the joint venture of prominent Chilean entrepreneurs and included, amongst many other things, a large-scale project called FAVA Collection: a contemporary art collection that seeks to build a national patrimony for Chile, curated by Pablo León de la Barra, Guggenheim UBS MAP Curator, Latin America (New York). For five days, Ch.ACO Art Fair transformed the city of Santiago into a both professional and massive gathering between national and international collectors, entrepreneurs, artists, curators, galleries, journalists, universities, students and enthusiasts, establishing the event as the most relevant milestone of the Chilean art market scene. To encourage the knowledge of Chile's cultural scene, Ch.ACO has promoted the creation of an independent web platform, www.aboutsantiago.cl, dedicated to reviewing the capital's best exhibitions, shows, and cultural events. A y C Arte Contemporáneo / arMO/ BACO / Caja de Cartón / Departamento44 / Espacio Hache / Espacio Opening / Espai Colona / Guerrilla / Museo de América / Mutt / Oficina Barroca. This program is sponsored by Swatch. Der Kunstmarkt: Kommerz, Inhalte, Institutionen. Alejandra Villasmil, Artishock (Chile) / Ana Luisa Lima, Tatúi (Brasilien) / Bridget Brown, Art Consultant (Vereinigtes Königreich) / Eduardo Brandao, Galerist, Vermelho (Brasilien) / Emilie Villez Director, Kadist Foundation (Frankreich) / Joel Yoss, Kunsthändler, (USA) / Fernando Mesta, Galerist, House of Gaga (Mexiko) / Francesca Ferrarini, Art Consultant, Look Lateral (Italien) / Francesco Sala, Kunstjournalist, Artribune (Italien) / Patricia Binder und Gerhard Haupt, Herausgeber von Universes in Universe (Deutschland) / Guillermo Machuca, art critic (Chile) / Henrique Faría, Kunsthändler (USA) / Katya Tilevich, Herausgeberin, Elephant (Belarus/USA) / Iván Navarro, Künstler (Chile/USA) / Manuela Moscoso, Kuratorin, Biennale Cuenca (Ecuador) / Manuel Cirauqui Curator, Dia Art Foundation (USA) / Marina Dacci, Direktorin, Maramotti Collection (Italien) / Pablo León de la Barra, Guggenheim UBS MAP Curator, Lateinamerika (USA) / Vivian Pffeifer, Vizepräsidentin, Christie’s America (USA). 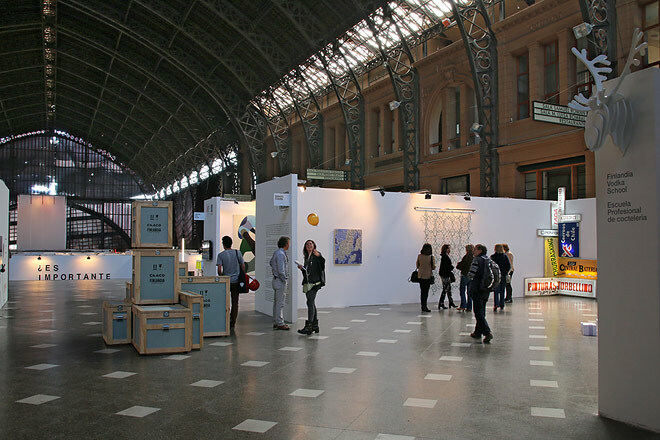 Founded in 2009, Ch.ACO Art Fair is a platform directed at developing the Chilean contemporary art system and the growth of the national art market. In its six-year trajectory, Ch.ACO has brought people closer to art, building up knowledge, curiosity and opportunities in the context of an ever-progressing country. FAVA (Fundacion Artes Visuales Asociados), the foundation in charge of the fair, is a non-for-profit institution that brings together prominent professionals related to the national art and culture scene. Its main project is the Patrons Program, a joint venture by Chilean entrepreneurs that includes, amongst many others, a large project called FAVA Collection: a contemporary art collection that seeks to build a national patrimony for Chile, curated by Pablo León de la Barra, Guggenheim UBS MAP Curator, Latin America (New York).